Spring on Saturn has brought images of what some are calling "The Rose of Saturn". The Cassini spacecraft orbiting Saturn has brought a fantastic view of the massive hurricane swirling atop the planet's north pole. The pictures captured by NASA's Cassini are the first visible light pictures, and the first relatively close up shots, of the 1,250 mile (2,000 kilometer) wide hurricane's eye. At the outer edges of the huge storm, winds are likely traveling at about 330 miles per hour, or 150 meters per second. Those speeds are about four times what hurricanes average on Earth. Scientists hope to study the huge storm in order to understand more about hurricanes on Earth because of the key differences in how Saturn's hurricane was formed and how it behaves. Scientists think the storm has been going at Saturn's north pole for years, but went unobserved until now because of Saturn's long winter and Cassini's orbit. Hurricanes on Earth tend to rely on a supply of warm ocean water to grow and sustain themselves. 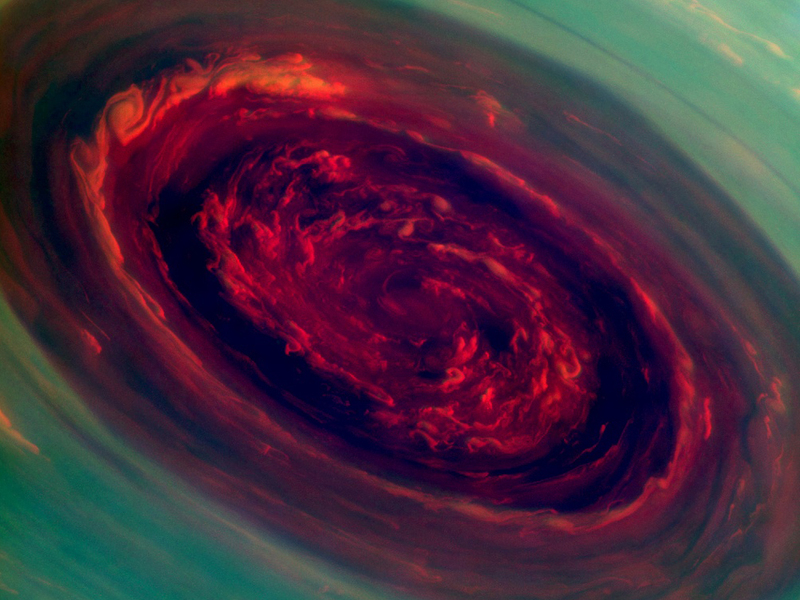 Andrew Ingersoll, a Cassini imaging team member, said the hurricane came as a surprise. 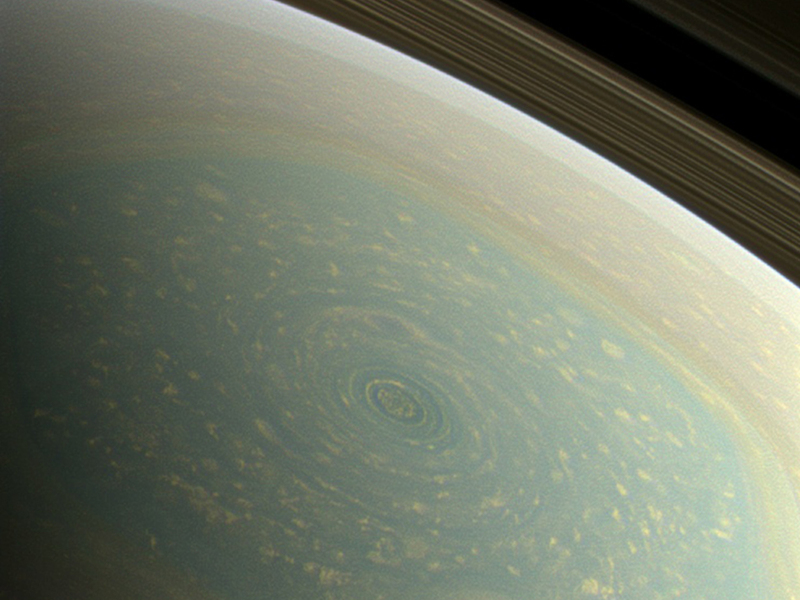 "We did a double take when we saw this vortex because it looks so much like a hurricane on Earth, but there it is at Saturn, on a much larger scale, and it is somehow getting by on the small amounts of water vapor in Saturn's hydrogen atmosphere." 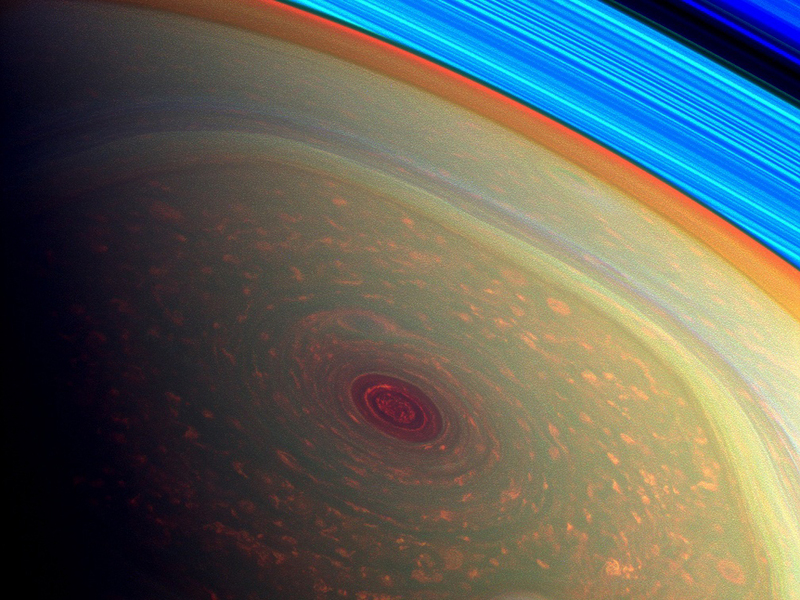 Saturn's hurricane isn't moving, either, as opposed to north-drifting Earth hurricanes. That's likely because there's no further north for it to go - it's locked at the north pole. Scientists think studying how the hurricane uses water vapor, how it moves, and how it sustains its violent winds will tell them new information about how hurricanes generate and sustain themselves. The discovery is only now coming to light because when Cassini arrived in 2004, Saturn's north pole was dark for winter. When the polar winter started to fade in 2009, letting the sun shine on the Saturnian north, Cassini started adjusting its orbit to get a better look at the poles. Cassini uses passes on Saturn's moon, Titan, as an aid to conserve propellant, so plotting out courses for the spacecraft takes years. Love space? Robots? Science? Good. Us too. That's why we do a weekly video show about science - the Geekend Update. This week, it's Fusion Rockets, Hexapod Robots, and Almost Earths.